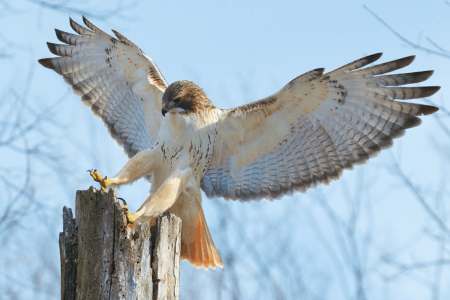 If you see a predatory bird, would you be able to identify if it’s a hawk or a falcon? Unless you’re a bird enthusiast or expert, you probably couldn’t tell them apart. The two birds are actually completely different from each other, from the way they hunt their prey to how they flap their wings. Interesting, huh? Read on. This article will discuss the difference between a hawk and a falcon. Hawks are predatory birds that belong to the family Accipitridae. They are diurnal and carnivorous. They have long talons and short, broad wings which allow them to glide through shrubs and trees. They also have multiple photoreceptors in their eyes, which gives them very sharp vision. Hawks beat their short wings quickly when flying. Once they gain momentum, they drift smoothly through the air. Bird enthusiasts call this pattern the “flap-flap-glide” pattern. Hawks usually look for food just before the sun sets. They typically eat small birds, but may also eat small ground-dwelling creatures like grasshoppers, crickets, squirrels, fish, snakes, and rats. They kill their prey using their powerful talons before eating them. Most hawk species stay with a single mating partner all throughout its life. Before early spring, which is their mating season, the male hawk and female hawk prepare their nest. This nest is where the female hawk will lay its eggs. Both male and female take care of the eggs until they hatch after a month. The fledglings will solely rely on their parents for food until they leave for good at six weeks old. A female hawk can lay up to five eggs in a year. The term falcon includes about 40 species of diurnal predatory birds that belong to the genus Falco. They have long, sickle-shaped wings and a side tooth. They are excellent fliers and possess extraordinary visual acuity. Falcons use their long, thin, tapered wings to fly at fast speeds and change directions easily in open spaces. They beat their wings to fly but may also glide along cliffs. Their wings are so thin, they look springy when they flap. Being carnivorous, falcons eat smaller birds and flying insects. They grab their prey using their talons and kill them with their beaks by stabbing, biting, or severing the neck. Sometimes, they kill their prey and eat them in midair. Falcons thrive in open spaces. They do not build their own nests, but they dwell in cavities on cliffs. What, then, is the difference between a hawk and a falcon? Hawks belong to the family Accipitridae while falcons belong to the genus Falco. In general, hawks have short and broad wings which allow them to glide through shrubs and trees. 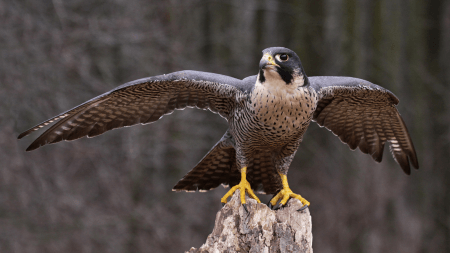 Falcons have long, tapered wings which allow them to fly fast in open spaces. Hawks have a simple curve on their beaks, whereas falcons have a notched beak or a side tooth. Hawks are known for their “flap-flap-glide” flying pattern. Falcons mainly flap their wings, but may occasionally glide along cliffs. Additionally, hawks build their nests while falcons choose to dwell in spots on cliffs. Both birds are carnivorous. Hawks eat small birds and insects but may also grab ground-dwelling animals. Falcons eat small birds and flying critters. Additionally, hawks kill their prey with their powerful talons, whereas falcons grab their prey using their talons and kill them with their beaks.